We offer a massive range of Hp notebooks. Below is a quick guide to some of our most popular Hp models. Hp range of Chromebooks run a lightning fast Chrome operating system. Chromebooks are designed for internet browsing, streaming and using google apps. They are the cheapest option which are ideal for students/education. The Hp Stream is an affordable Windows PC that offers cloud storage. Like the Chromebook it is designed for online browsing & streaming. 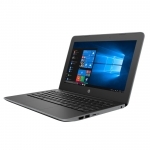 The Probook series is Hp’s primary offering for small to medium business users. This affordable business range of laptops offers durability, power and security features over the consumer models. Hp’s line of Elitebook Laptops are targeted at business & enterprise customers. Featuring ultra-thin design which is lightweight yet durable in construction the Elitebook offers superior performance packed with enterprise-class features like docking capability and industry leading security. HP Elite PCs give you rock-solid, tested durability and outstanding battery life. Hp Z Book Workstations deliver impressive professional 3D graphics and outstanding performance even from the most demanding applications. This mobile series is recommended for users of CAD and professional photo/video production applications.